…why would you not get a Facebook page for your business or organization? Here are four reasons why a Facebook page is better than a Yellow pages ad, and why it’s not even a close call. A Yellow Pages ad is expensive. A Facebook page is free. A Yellow Pages ad typically has a distinctive cast that suggests jaundice. Color is even more expensive. Your organization’s logo (or other photo) goes on your Facebook page in full-color for free. A Yellow Pages ad reaches a limited geographic market. Anyone in the world can see your Facebook page, except for citizens of repressive political regimes or employees or corporate regimes with a blocking philosophy. I’m certain those with a proprietary interest in Yellow Pages (or Yellow Book, or whatever post Ma Bell-breakup variety you have in your area) would be quick to point out how they also have online directories as part of their package. But that misses the point. The yellows used to have monopolies when people were looking for a particular category of service. It was expensive to produce a paper directory and deliver to every household in an area. Now with Yelp and Angie’s List and countless other similar sites, it’s easy for potential customers to get information (including contact phone numbers) for local service providers. And don’t forget local search in Google. My point is not to run down the yellow directories, or to say you shouldn’t use them. That’s a call you have to make. Maybe they work for you, and should be part of your mix. If their publishers are doing their jobs well, they should be continually adding features to improve their value proposition. 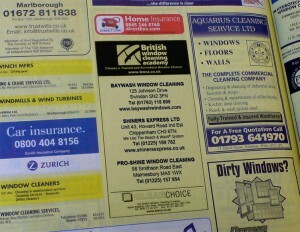 But if you’re spending substantially for Yellow Pages, why wouldn’t you use the free option, too? Author Lee AasePosted on December 21, 2010 December 20, 2010 Categories advertising, FacebookTags advertising, Angie's List, Facebook, Google, Yellow Pages, Yelp!